Millennials have shown significantly less interest in owning homes than past generations. Baby boomers are currently seeking to downside in their retirement years, selling the houses in which they raised families. Mortgage rates are at a five-year high. Predatory bank lenders are scraping the bottom of the subprime barrel in an attempt to force huge loans on the least qualified buyers so they can buy Lamborghinis. The housing market is primed for a fall. Just one of many asset classes that have been inflated by the Fed and risen to irrational levels in the Everything Bubble. The Fed has raised interest rates six times since the end of 2015. Their forward guidance from recent Federal Open Market Committee (FOMC) meeting statements and minutes tells of their plans on continuing to do so throughout this year and next. Additionally, the Fed owns over one-quarter of all residential mortgage-backed securities (MBS) through QE purchases. Their stated plan is to reduce their ownership of those securities over the next several quarters. 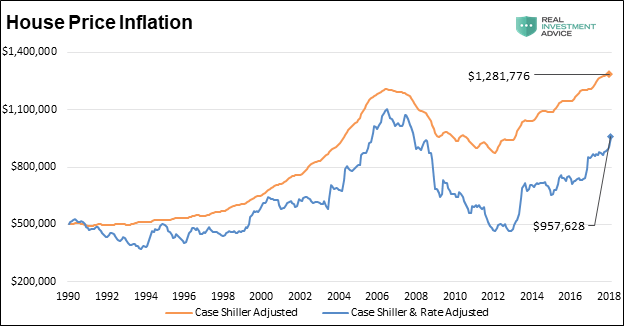 If the Fed continues on their expected path with regard to rates and balance sheet, it creates a significant market adjustment in terms of supply and demand dynamics and further implies that mortgage rates should rise. The consequences of higher mortgage rates will not only affect buyers and sellers of housing but also make borrowing on the equity in homes more expensive. From a macro perspective, consider that housing contributes 15-18% to GDP, according to the National Association of Home Builders (NAHB). While we do not expect higher rates to devastate the housing market, we do think a period of price declines and economic weakness could accompany higher rates.